According to Full Count, the unlikely rise of Daniel Nava to major league stardom inspired another rising star: Xander Bogaerts. Daniel Nava has been a big factor in the Red Sox success lately, lighting up the Yankees and hitting .306 while setting career highs in home runs (11), doubles (28) and RBI's (63), according to Full count. Bogaerts says he talks to Nava a lot, especially on patience. Nava takes a lot of pitches, hence a .392 On Base Percentage in 493 plate appearances, according to Full Count. In 5 minor league season, Nava has never had an OBP lower than .372 and hit .400 3 times and Xander is trying to emulate that part of his game. 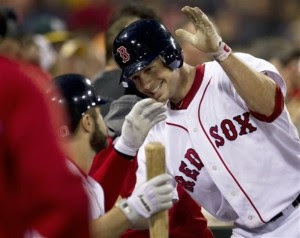 Nava has said to Xander to go with whatever is comfortable for him, as that is what got him into the majors. Here's what Nava had to say on the subject, according to Full Count. Sound advice for the young phenom. The enthusiasm and willingness to learn displayed by Bogaerts will only help him in his playing career. Hopefully, he'll use his conversations with Nava and other players on the team to become a superstar, and hopefully he'll be with the Red Sox for years and years to come. This shows that he is humble and doesn't act like he's the greatest thing to happen to baseball since it was invented (sound like any other young breakout stars? ), and that's a good sign that he will indeed do well and that there are bright things in his future. Follow me on Twitter @ConorJF1016 or feel free to leave a comment below.